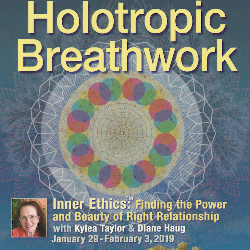 Discovering ethical Right Relationship with clients and others in our lives requires the same courageous approach to self-discovery that brought us to Holotropic Breathwork® and is just as important for those of us who want to do this work or find Right Relationship to our own inner parts and to the other people in our lives. The Ethics of Caring provides a no-blame model based on self-compassion and curiosity that supports a willingness to uncover and own our motivations, share with our peers what we have learned from ethical missteps, and make good choices on behalf of our clients and ourselves. We’ll do breathwork together, learn The Ethics of Caring model, role-play actual challenges we’ve experienced in the practice of Holotropic Breathwork, discuss countertransference, and experiment with the expressive arts via the self-discovery method of SoulCollage®, a creative practice that helps us view and listen to the feelings and counsel of our many parts. Included in your registration fee is a SoulCollage® Card-Making Supply Kit and additional supplies will be available in the store.